Gallia Academy senior Ashton Webb (11) goes up for a spike, during the Blue Angels’ tournament-opening win over Jackson on Wednesday in Centenary, Ohio. Gallia Academy senior Hunter Copley saves a blocked ball, during the Blue Angels’ triumph on Wednesday in Centenary, Ohio. CENTENARY, Ohio — A power-packed start to the postseason . 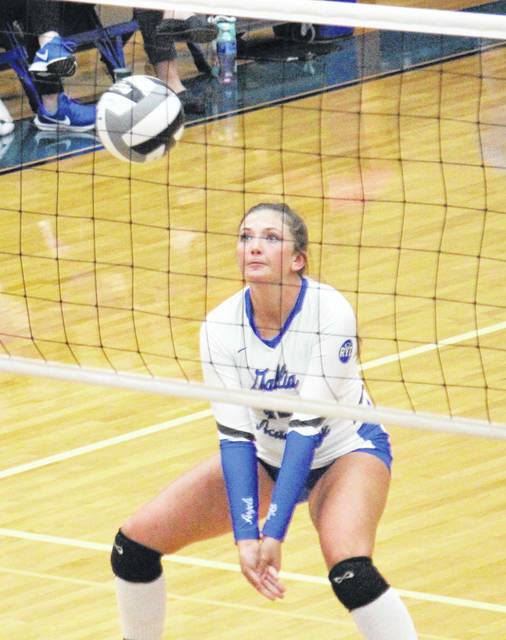 The Gallia Academy volleyball team pounded out 39 kills and a dozen aces in its Division II sectional semifinal victory on Wednesday evening in Gallia County, as the second-seeded Blue Angels rolled to a straight-games sweep over No. 7 Jackson. 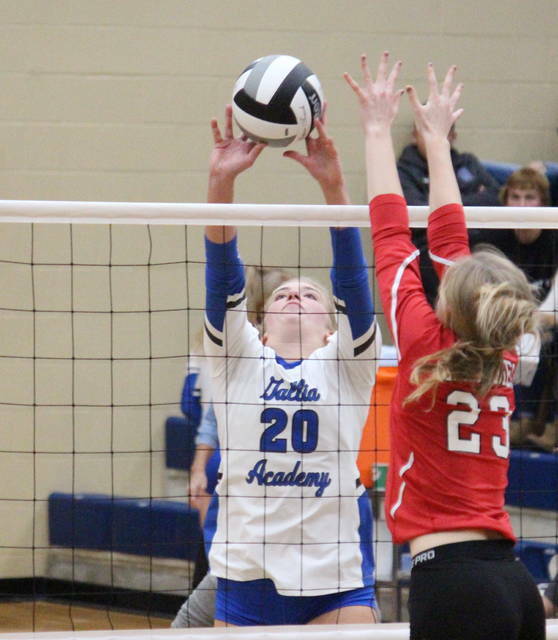 Gallia Academy (20-3) —reaching the 20-win plateau for the fourth straight season — began the night with a wire-to-wire 25-9 victory in the opening game, in which the Blue Angels had an 88.9 side-out percentage. Jackson (11-12) claimed its first and only lead of the night at 2-0 in the second set, but GAHS scored the next seven points and rolled to the 25-13 victory. The Blue Angels closed the sweep with a match-best 16 kills on their way to a 25-16 win in the third game, which they also led from start-to-finish. 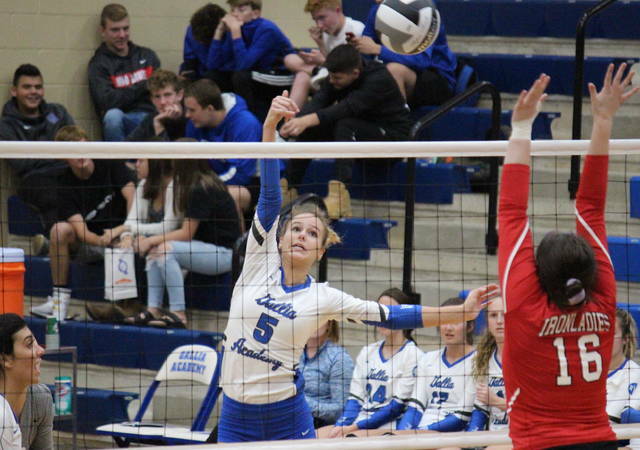 After the victory, fifth-year Gallia Academy head coach Janice Rosier was happy with how her team played, but hopes they can keep their focus even when they have a comfortable lead. Rosier also noted the quick pace of play as a benefit to the Blue Angels. The Blue Angels earned a 71.8 side-out percentage for the game, while Jackson finished with 36.5 side-out percentage. The hosts also earned a 29-to-20 advantage in digs. GAHS had a 93.2 serve percentage to go with its 12 aces, while the Ironladies had a trio of aces and an 87.2 serve percentage. Gallia Academy’s 39 kills led to a 37.3 hitting percentage, while the guests finished with 19 kills and a 6.0 hitting percentage. Alex Barnes led the Blue and White with 21 points, including a trio of aces. Next were Peri Martin and Taylor Burnette with nine and seven points respectively, including four aces apiece. Ashton Webb had four points and one ace in the triumph, Hunter Copley came up with three markers, while Maddie Wright added one service point. Gallia Academy’s net attack was led by Webb with 18 kills and one block. Barnes — who led the team’s defense with 13 digs — had six kills and one block at the net, while Wright and Maddy Petro picked up five kills apiece, with two blocks and one block respectively. Martin recorded four kills, two blocks and a match-best 30 assists, while Aubrey Unroe contributed one kill to the winning cause. Abbey Munn led the Ironladies with three service points, including an ace. Reaghann Folden, Jenna Smalley and Emma Stroth had two points apiece, with an ace by Folden, while Halle Hughes and Olivia Lanning both added a point, with an ace by Lanning. At the net, JHS was led by Munn with five kills and three blocks. Kylee Bako was next with five kills, followed by Holly Sexton with four kills and a block. Gracie Walburn had a team-best 13 assists for the guests, while Stroth and Hughes tied for a team-high with four digs each. The Blue Angels also swept the Ironladies on Sept. 17 in the Apple City. GAHS has now defeated its JHS in 10 consecutive meetings, with the last Ironladies victory in the series coming on Oct. 11, 2012, in Jackson. 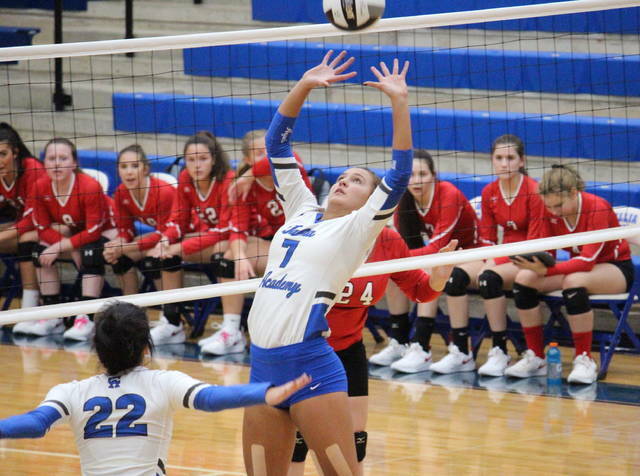 The Blue Angels grace their home court for the final time this year in Saturday’s sectional final, in which they will face third-seeded Waverly at 4 p.m.
Rosier acknowledged some areas her team needs to work on before the sectional title bout. GAHS is now 9-0 at home this season, winning all-9 matches in straight sets. Waverly advances to the sectional championship match after a straight games — 25-22, 25-20, 25-20 — victory over sixth-seeded Athens. 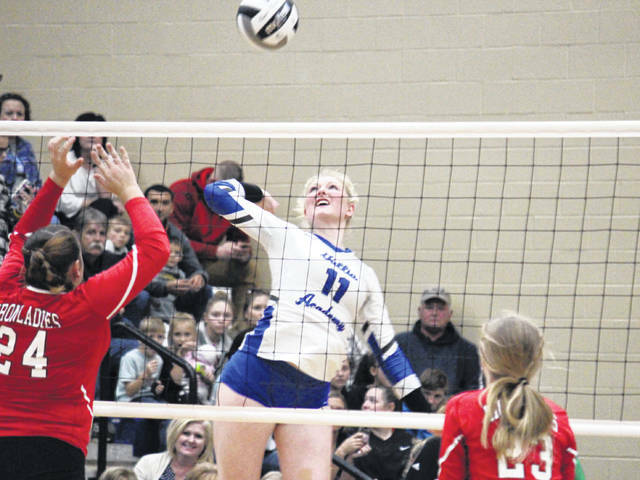 Gallia Academy will be aiming for its fourth straight trip to the district semifinal.